Burt Takeuchi graduated with a degree in biology from San Jose State University in 1995, but in his latest venture, the only thing he’s dissected was hours of oral history interviews. The Sansei native of West Los Angeles, who grew up in the San Jose area, is a Screen Actors Guild member who has played bit parts and extras in productions ranging from small films, to television roles to major Hollywood films. Gaining insight into how such productions are made, he embarked on a journey to piece together a string of interviews with Nisei veterans of the famed 442nd Regimental Combat Team — the most decorated American unit for its size and length of service. One by one the veterans recollect their World War II experiences in Italy, their heroic rescue of the “Lost Battalion,” the breaking of the Gothic Line, and the liberation of the Dachau Nazi death camp. Nichi Bei Weekly: You graduated with a degree in biology, which is a far cry from cinema. How did your interest in films come about? Burt Takeuchi: I always liked films but it was my late mother that inspired me to pursue careers in the arts: film, acting, graphics, etc. She thought that it came the most natural to me. So film has been a part of my life. Mom would take me to see Kurosawa films starring Toshiro Mifune when I was a teen. NBW: What inspired you to make this particular film? BT: Originally I had the idea of making a short or feature independent film on the 442nd. At the time, I did not have the film experience, and digital video technology was a ways away from where it is now. As I started to interview more Nisei vets, many started to pass away. So I started to record these amazing stories on digital video whenever I could. This way the stories would be preserved and not be lost forever. 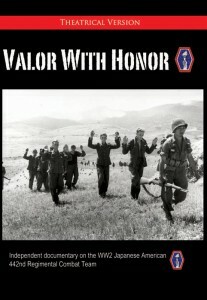 A handful of vets became dozens and “Valor with Honor” was born. NBW: How many of your interview subjects have since passed on? BT: About 30 percent have passed away and many are very senile now. 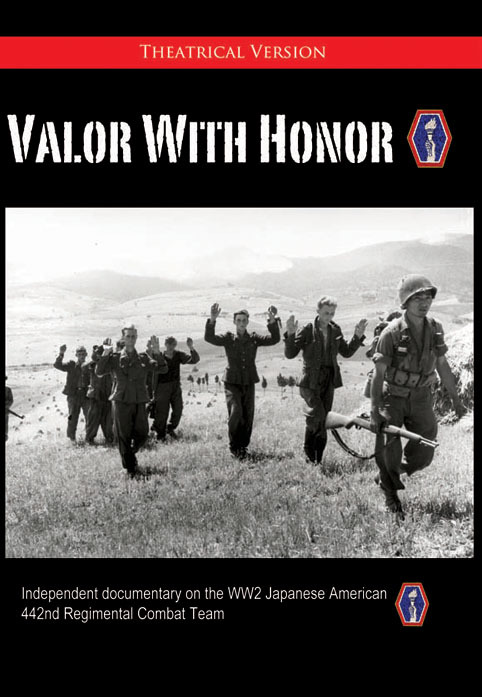 NBW: Can you discuss a bit about the process of making “Valor with Honor,” including when you started and how long it took to make? BT: It took about three years to capture all the interviews and edit them into a rough cut. The first cut was over five to six hours long, and it took months to get it to the two hours needed for a rough cut. Probably four to five years total if you count the pre-production efforts: preliminary interviews, tracking down key vets to interview, photos, etc. NBW: How were you able to fund the film? BT: Friends helped pay for the software and cameras. Scrimping money and using credit cards. It’s tough for first time filmmakers. However, I do not think this will be as much of a problem after the success of “Valor with Honor.” People have to see your work and then they can have faith in you as a filmmaker. There’s a lot of great ideas out there but very few come through with a fully completed solid film in the end. NBW: What challenges did you face in creating the film? BT: You never knew what the vets were going to say in each interview. So you just ask questions and ask them to elaborate. Each interview was a unique experience. I wanted to be careful not to upset them and get the most honest answers to my questions. Most of the interviews were outstanding. NBW: Your film doesn’t include any narration or broad historical context, choosing to let the veterans and those from the “Lost Battalion” that they saved speak about their experiences one by one. Why did you choose to go this particular route? BT: I wanted to give the vets their own voice and let the audience hear the stories as I heard them told. It was not necessary to have any narration so I decided to use text and photos to tell the rest of the story. Many of the vets had advanced degrees so they spoke extremely well, so why edit their description of the events in the film out? It is a risky way to make a documentary, but a few have done it successfully over the decades. You can lose the audience if you don’t do it right. NBW: There are some emotional recollections in the film. How difficult was it to draw out such, often times, painful memories? He wept after I left his house. NBW: Much has been brought out in recent years about the resistance to the military draft within the wartime concentration camps. Did any of your interview subjects harbor any particular feelings about this long-standing community controversy, between those who served during World War II, and those who chose to resist the draft based upon constitutional principle? BT: Most of the differences the vets had have passed a long time ago. Some families broke apart over the issue but most have put it aside. I suppose some vets might hold hard feelings but most have forgotten these issues. BT: This is only one aspect from the Nisei experience. A Nisei vet named Robert Kashiwagi said, “There were over 120,000 … who were sent into the camps. So, there must be 120,000 stories to be told.” I agree, so this film is from the perspective of the Nisei vets who fought in World War II. There were others [such as Nisei linguists in the Military Intelligence Service], but that is a very unique story on its own. NBW: Now that you have your debut film out of the way, are you planning on making any more films? BT: There might be a few vets still around that could be interviewed but their time is fading away. I am still interested in making a feature dramatic film on the 442nd. Financing and distribution is the main issue in pre-production. If there are no major obstacles then we might give it a shot! Another might be an Asian American Western film. “Valor with Honor” will be screened as part of the Nihonmachi Asian American Film Retrospective on Saturday, Aug. 13 and Sunday, Aug. 14 at Viz Cinema, 1746 Post St. in San Francisco’s Japantown. The film will be screened at 2 p.m. on both days, and partial proceeds benefit the Nichi Bei Foundation. For more information, visit www.nichibei.org. It’s a pity that someone like Burt didn’t come along many years earlier to interview the vets. My uncle Tut Tatsuno, who was too late to go to Europe, was a translator on Gen McArthur’s staff in ?Tokyo, and he would have been able to relate his experiences. He was also the “10th” man on the University of Utah basketball team (though he was acutally 9th) and didn’t get to play in the National championship game that Utah won in 1944 (see the March 22, 2010 issue of Sports Illustrated). Following basic training at Fort Hood, Texas in 1966, I worked with some of the drill instructors that had trained me. I was curious as to why, though still tough on me, I detected something different about how they related with me. Turns out they were either a part of the Lost Texas Battalion or knew fellow G.I.’s that had been rescued by the little “nee-see” troops. Thus I felt a bond with the 442nd…..
Something about enough time passing by that veterans can finally talk openly about the war. It seems that when people are about 70-80 years that they can articulate and describe their experiences in the war. This seems to be true of many combat vets including Nisei WW2 vets. Many interviewers may not have the background to understand the issues and history the Nisei faced in WW2.